Знание - мощная сила, и книга - вечный фонд мудрости. И путеводная нить. И это потрясающий образец такого рода работы, которая помогает увидеть новые пути к познанию мира политики и военного дела и изменению личного отношения к истории - "Don't Give Me That Attitude!. 24 Rude, Selfish, Insensitive Things Kids Do and How to Stop Them"
Does your kid never take no for an answer and demand things go his way? Do her theatrics leave you drained at the end of the day? Are you resorting to bribes and threats to get your kid to do chores? Does he cheat, complain, or blame others for his problems? Do you feel you’re running a hotel instead of a home? Are you starting to feel like your child’s personal ATM machine? What happened? You thought you were doing the best for your child and didn’t set out to raise a selfish, insensitive, spoiled kid. 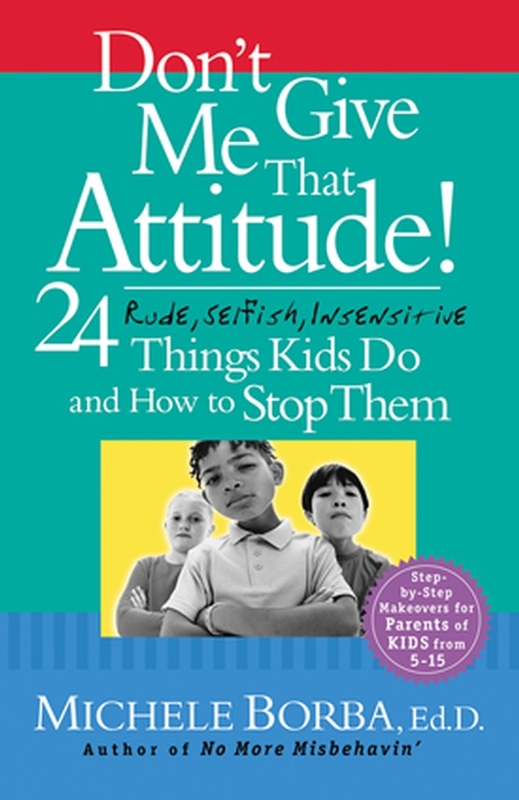 In her newest book, Don’t Give Me That Attitude! parenting expert Michele Borba offers you an effective, practical, and hands-on approach to help you work with your child to fix that very annoying but widespread youthful characteristic, attitude. If you have a child who is arrogant, bad-mannered, bad-tempered, a cheat, cruel, demanding, domineering, fresh, greedy, impatient, insensitive, irresponsible, jealous, judgmental, lazy, manipulative, narrow-minded, noncompliant, pessimistic, a poor loser, selfish, uncooperative, ungrateful, or unhelpful, this is the book for you! Нет сомнений, что "Don't Give Me That Attitude!. 24 Rude, Selfish, Insensitive Things Kids Do and How to Stop Them" окажется своевременной, полезной и познавательной.